When bleeding occurs external or internal and blood can't clot properly this condition is called Hemophilia. If a person bleeding not stop after injury,then this should not be considered a common and normal problem,because this problem indicates hemophilia.Internal bleeding during hemophilia can damage your organs and tissues and put life in danger.People with Hemophilia lack a certain protein,which responsible for blood clotting.There are 13 types of clotting factors that work with platelets in order to prevent bleeding in the area of ​​injury.Platelets are small blood cells that are formed in your bone marrow. This disease is diagnosed with some blood tests for check clotting factors. 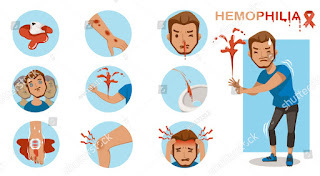 When the blood flows,the body usually collects blood cells and prevents blood from flowing in the form of a blood clot.All clotting factors in this process contribute. Haemophilia is caused by a reduction in one of these clotting factors.There are many types of hemophilia that are mostly genetic,for whom the genes are responsive. If you are suffering from all these symptoms,then immediately contact the doctor and start treatment, in this case a doctor can give you the right opinion.